A new species from the terminal Ediacaran, Cloudina carinata, has been discovered in Spain. The tubular fossil, described in a recent issue of the journal Precambrian Research1, lived between 550 and 543 million years ago and was one of the first animals to leave behind evidence of reproduction. 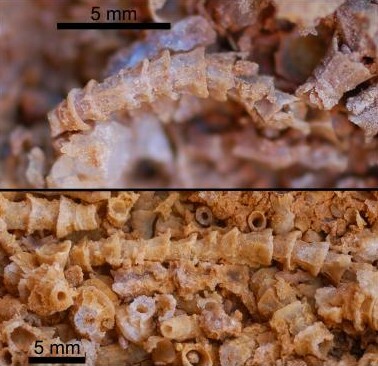 A close up of the well preserved fossils of Cloudina carinata. Photo credit - Cortijo et al. The creature, which may have been similar in nature to annelid worms or corals, was also one of the first species to develop an external skeleton. The discovery, unearthed in Badajoz by researchers from the University of Extremadura, was well enough preserved to have recorded its three dimensional structure. “Cloudina carinata is characterised by its elaborate ornamentation and complexity of the shells and tube that are formed when inserted”, said lead author on the study, Iván Cortijo. The finding of Cloudina carinata is invaluable in helping us understand the early evolution of animals, Cortijo explained, adding that also “its importance for understanding the origin of skeletons is indisputable”. The first specimen from the genus Cloudina was uncovered in Namibia in the seventies. The presence of creatures from this genus is recognised by palaeontologists as being indicative of a time near the end of both the Ediacaran period and the Proterozoic eon. Living as it did just before the Cambrian explosion, the sudden increase in animal diversity 540 million years ago, Cloudina will help us understand the early development of animals in this crucial period in their development.